Designating any sports clash as "the greatest game" is a weighty claim, fraught with peril. 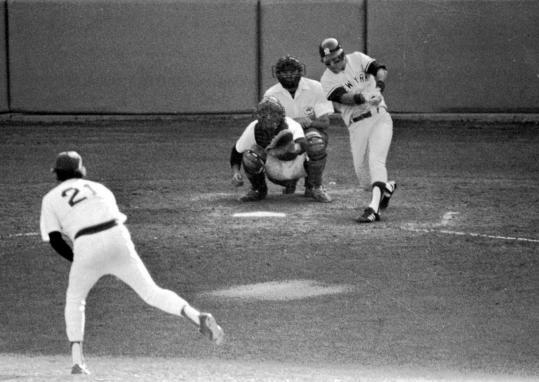 Was the greatest contest in baseball history the single-game playoff between the Red Sox and Yankees on Oct. 2, 1978? It certainly ranks high among Red Sox/Yankees battles. But the greatest baseball game ever? Author Richard Bradley never advances that argument, though he surely agreed to his book's title. The superlative may have been driven by marketing, but, getting past the title, it's quite a good book. The 1978 season was a heady one for Red Sox fans, starved without a World Championship for - at that point - an even 60 years. Boston had taken the World Series to game seven in 1975, but lost. After a downturn in '76, the team came within 2 1/2 games of first place in 1977. And in 1978, the year Bradley terms "the season of greatest expectations," the Red Sox won and won and won. By July 19, they had a 14-game lead over the mighty Yankees. All finally seemed right with the world in New England. Then New York got really hot, while Boston tailed off, and its lead steadily eroded. By Sept. 10, after a four-game Yankees sweep over the Sox dubbed "the Boston Massacre," the two teams were dead even in the standings. Six days later, the Yankees held a 3 1/2-game lead over the Sox, with just two weeks remaining. But the Sox righted their ship, started to win again, and both teams finished the season 99-63, necessitating the in-or-out playoff at Fenway. In the game, the Red Sox took a 1-0 lead in the second and made that 2-0 in the bottom of the sixth. But then Yankees infielder Bucky Dent hit his infamous three-run home run that just edged itself over the top of the left-field wall, and the Yankees added another run in the top of the seventh. They built a 5-2 lead, scoring one more in the eighth. But Boston scored twice in the bottom of the eighth to make it a 5-4 game. The Sox had runners on first and second with one out in the bottom of the ninth, but just couldn't even the score. Season over for the Sox. Bradley's book tells the story of the game, of course, but tells it with rare flavor, alternating chapters on each inning with others offering rich perspective. Even during his chapter on the "Top of the First," he devotes some pages to the birth of free agency in ways that enables even those of us who lived through the era to better appreciate the context of the times. He demonstrates a solid grasp of the hitters and the pitchers and their tendencies during the season, as well as the unfolding "game within the game" strategizing and how adjustments are made batter-by-batter, depending on circumstances. The detail gets down to the level of describing New York catcher Thurman Munson's batter's box rituals. Bradley's profiles of key players are rewarding. The author can authoritatively describe the "telltale red dot" of Red Sox (and former Yankees) pitcher Mike Torrez's slider, the optical illusion given by a breaking ball as the red seams on the baseball spin in a certain way. He takes time helping us get to know the men, on both teams, who played this game. Though Bradley takes until page 87 to get to the top of the second inning, the book never flags. If he favored one team or another, it's not evident. It's undeniably easier for Red Sox fans to read this book these days, given the World Series wins in 2004 and 2007, but they can still appreciate the angst of the times. This one game renewed and solidified the rivalry between these two great teams for another generation, and Bradley's book helps show some of the roots of the rivalry from the days before it became to appear contrived. Bill Nowlin is the author of "Day by Day with the Boston Red Sox" and "Ted Williams at War."